My phone isn't the one dinging and buzzing with notifications. That would drive me crazy. I don't like Twitter badges and email is just a scary thought. But I set Remind notifications to banners on my locked screen because my students deserve it. 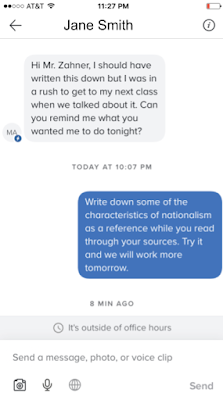 They deserve to be able to ask me a question while working on an assignment and get a response that hopefully enables them to persist. Kids these days communicate differently ‒ nobody questions that. They use their phones to chat back and forth in small bits, and, consequently, they don't like waiting or listening ‒ there goes traditional schooling. I'm not going to lie. It's tough. I often can't finish a sentence before they ask a question that would've been answered if they had just listened for another second. It sounds frustrating, but it's where they are. 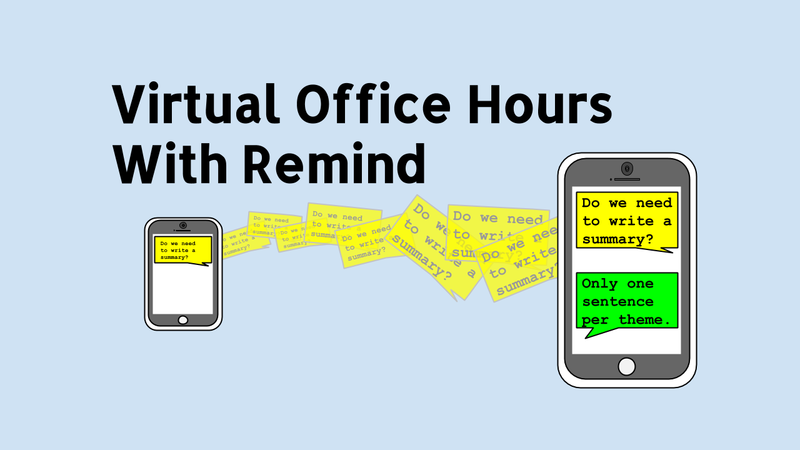 Meeting kids where they are has led me to practice virtual office hours with the Remind app. It's one of three apps that I require for my classes, and it allows my students to ask questions almost anytime. 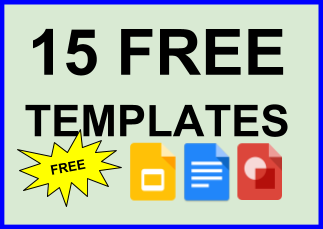 You may be thinking that email would work just fine, but it doesn't. I don't check my email more than a couple times outside of school hours, and kids are much less consistent. During school it's about once an hour or so, but after school I can be reached best via text (or Remind app). I've been doing virtual office hours for about four years, and it's the days like today that really make it worthwhile. You see, my students have a paper due tomorrow, and several of them need clarification of expectations or help staying focused on the task of finding the evidence that support their thesis. The text above is from a student who could be perceived as a procrastinator, unorganized, or just not a good student. Although these descriptions may be true, this student is really great at making connections between one idea or thing to another development in history. 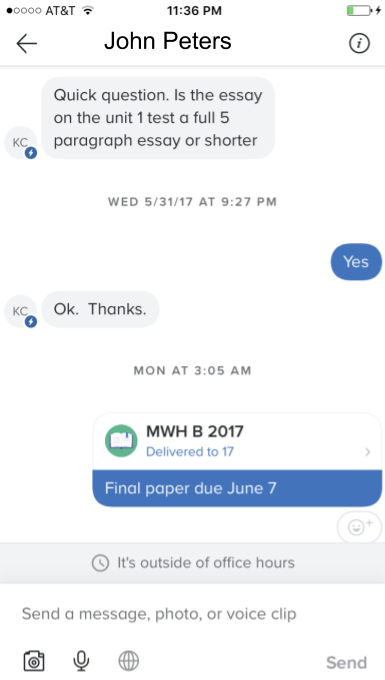 She just gets overwhelmed by the amount of work it takes to complete long term assignments and needs more help than school hours provide. I particularly enjoy how well she takes ownership of her choices and reflects on why she likely made that choice. It's hard to ask for help. That's why I gladly offer it through virtual office hours. Sometimes help is a little more basic, like the example below. This student is making up work from medical absence. It's hard enough to keep up with school work while making up work from missed time from being hospitalized. 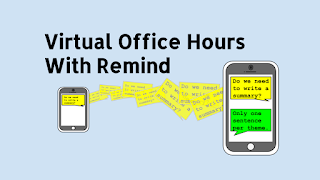 Being there for students when they are in the mode to do the work is what makes virtual office hours so powerful. I use Remind, but I'm sure there are other apps or ways to facilitate communication outside of school hours. Which reminds me ... I was once told by a teacher that they don't want to be available to students outside of school. Personally, I didn't become a teacher to punch a clock. I love learning and want to fan that passion among the youth.